Matthew left for a business trip last Monday until Wednesday night. While he was gone, all I could think about was how hard it was to do this mom thing every day without his comfort and support. I was constantly focusing on how I was losing my mind, and forgetting that my children were helping me find my soul. It made me realize how much I depend on that connection. He can come home from work to do absolutely nothing, but I feel an instant sense of relief and security in knowing I'm not in this parenting journey alone. Two days later, I took off for a girls trip in Park City. I couldn't wait to spend some time in a beautiful place with beautiful people. As we talked all the live long day, we shared details of our relationships with our husbands and children. We left them to get a break, but it was the majority of our conversation. It's too hard not to talk about motherhood when it's what fills your whole life. We talked about struggles and adversity in our roles as mothers. And about the importance of having the support of community and sisterhood with other strong women. We should always be there for one another. We should reach out to one another when we feel like we're losing our minds. That relationship of empathy, love and compassion will help us continue doing that most important work. To raise our children to be the good in this world. Isn't that our greatest goal as mother's? To see our children succeed and change this world for the better? That is my goal. And I know that I am not alone in reaching it. So many angels in the form of a person have lifted me up when I feel I'm failing in the role of motherhood. It's through those angels that I know my Heavenly Father and Savior, Jesus Christ, know me personally and love me unconditionally. God sent me these children because He trusted me to nurture, love and teach them. As I've prayed in moments of defeat and desperation, the spirit witnesses to me that He knows I am doing my best. That my best is enough. I'm grateful for that knowledge, and for all of the angels around me that make this journey a little bit easier. I hope you enjoy this free printable and have a great day! Family First || Monthly Free Printable Kick-Off! I know this is after the fact, but I made these printables before life got new house crazy. I love this country so much and I thought I'd share them with you anyway. I'm only like a week late, right? You could still enjoy a whole month with these in your home, maybe even some year round patriotism? Ha! Regardless, I was really touched by this quote I found by Joseph Campbell and want to remember it all year long. I'll be forever indebted to all of the heroes who make this country a free and better place. I'm extremely grateful to live in a place where I am free to speak, vote, work, and practice the religion of my choice. I live a very blessed and happy life because of those freedoms. I hope you all had a wonderful 4th with those that you love. You can find the download links below the images, as usual! I just want to say THANK YOU! 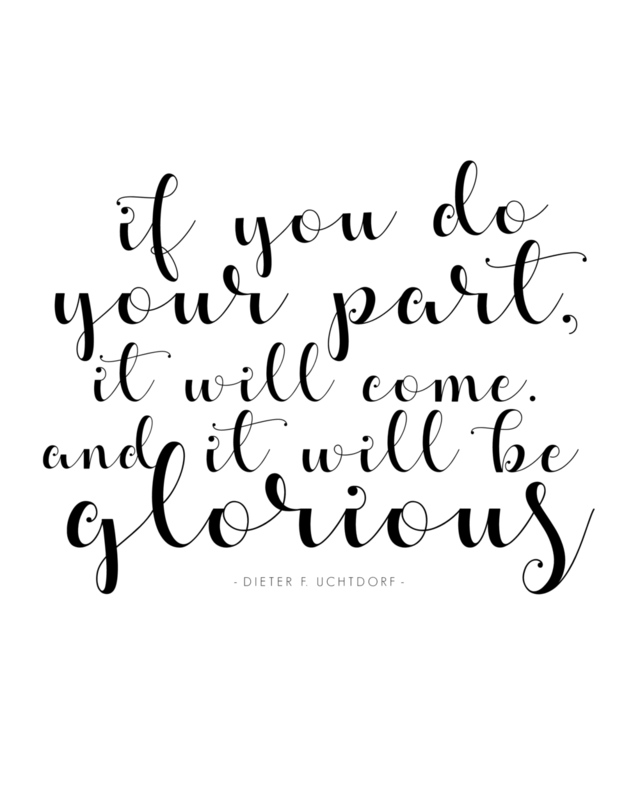 So many of you have loved my free general conference quote printables! Well, they have been so popular that I decided to start giving a freebie out every month! I'm going to make them based on recent experiences or things I would want to post about our life on the blog. The most recent being the importance of putting my family first. The whole reason we decided to move was because of this ideal. Family isn't just an important thing, it's EVERYTHING. And they really are everything to me. I'd do anything to make our lives together a happier one. To kick off this new adventure, I designed this darling print using some tropical watercolor florals from Angie Makes. They make me feel like it's a tropical summer oasis inside my home. Who doesn't want that? I also designed a plain black and white print for the more minimalist folks out there. Scroll and click below the images to download them! There you go! I hope you guys love these new prints! Be sure to subscribe to my email list below if you don't want to miss any freebies! Please let me know what you think and I'd love to hear what style prints you would like me to do in the future! Lots of love!